Saddle up a horse at Kaoha Nui Ranch on Raiatea for a half-day ride through the scenic valley and mountain ridges behind the ranch. 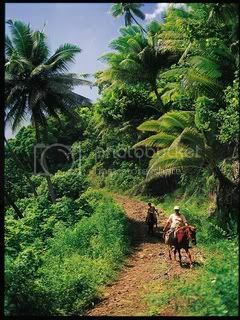 Marquesan bred horses will take you into the heart of the island where you will visit Raiatea’s pristine botanical gardens. It is at the top of these mountains that you will be able to see the majestic profiles of Tahaa and Huahine in the distance.